Book a hotel for the day in Hood River and get some great deals and offers for day rooms. Hood River’s multifaceted climate is a little like Sochi’s — only without palm trees. Popularized as a windsurfing destination in the 1980s, this waterfront town in the Columbia River Gorge is blessed with mild to balmy temperatures nine months of the year, while nearby Mount Hood never runs out of snow. The result is an outdoor adventurer’s playground, and the saying “the Gorge is my gym” has inspired a blog of the same name, featuring daily wind and snow reports. The ultimate workout is the hat trick — a sport on snow, water and earth in the same day. It could be ski, paddleboard and bike; or snowboard, windsurf/kiteboard and hike. Or perhaps Nordic ski, white-water kayak and rock climb. And don’t forget fly fishing for steelhead. Once you’re hooked, the hardest part is the decision. 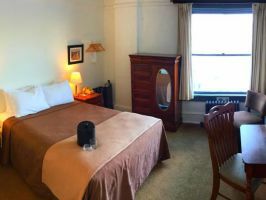 At Hotels By Day, we work towards meeting your needs by offering same day check in and check out options at day hotels, for your perfect hourly hotel in Hood River to take a “daycation”.